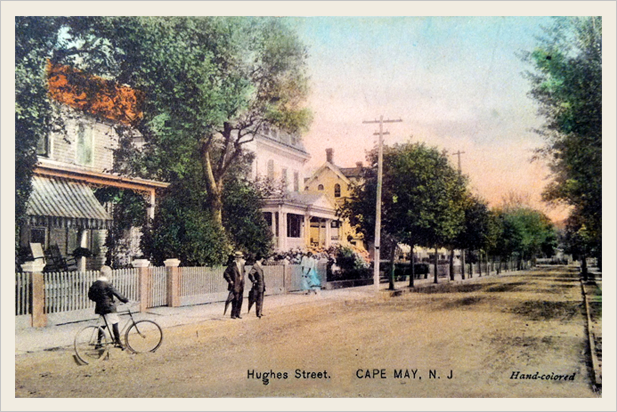 The Longfellow House is ideally situated on Hughes, Cape May's oldest residential street. A wonderful location with details like authentic gas lamps (still in operation), vintage gingerbread trim on houses, and historic victorian architecture. Our house is three blocks from the beach and the famous Washington Street walking mall, home to renown South Jersey restaurants and terrific shopping. In short, the Hughes St. location is perfect for Cape May vacation goers and right in the heart and soul of what makes this town so special. Since Hughes Street is one way, there's less traffic flow which can be a comfort for families with children. It's also nice and quiet, providing a degree of privacy that our guests truly appreciate, and with our small yards in the front and back kids can get out of the house and play (or go to the beach). Hughes Street cuts right through the heart of Cape May's famous Historic District, as you will learn if you take one of the many horse & buggy tours that clip-clop up our street every day. Our guests and their children love watching the horses from the front porch. It's a memory many of us adults remember from our childhood too! Our neighborhood features amazing examples of the classic Victorian architecture that defines Cape May. The landmark structures seen in the picture to the right (click for large version) are a short walk from the Longfellow House. If all this tickles your Victorian fancy you will love Hughes Street, and you will love staying in the Longfellow House for your Cape May family vacation. 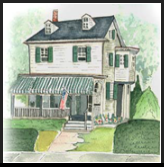 For a detailed view of the Longfellow Guest House location (helpful if you're new to Cape May) see our google map below. * Still have Questions? See our FAQs. Use the helpful Google Map below to get a birds eye view of where we are in proximity to town, the beach, and main historic area. Click the red flag, that indicates our location, to be taken to a live Google Map in a separate browser window. Kids (and adults) love that the horse and carriage tours clip clop right down Hughes street. That's "Knight" there, who loves to stop in front of our home. Our home is surrounded by incredible victorian architecture — The Mainstay and Southern Mansion are a block away, the Abbey is 3 blocks, and the Physick Estate is a short walk down Washington St.